Been awhile since I checked in. Some friends and I had a lively discussion about the future of US stocks over the next 2 years, with the S&P being the gauge. I would like to get a more "world view" from traders here. So, what is your prediction for the S&P over the next couple years? Do you base your opinion on TA, FA or both? 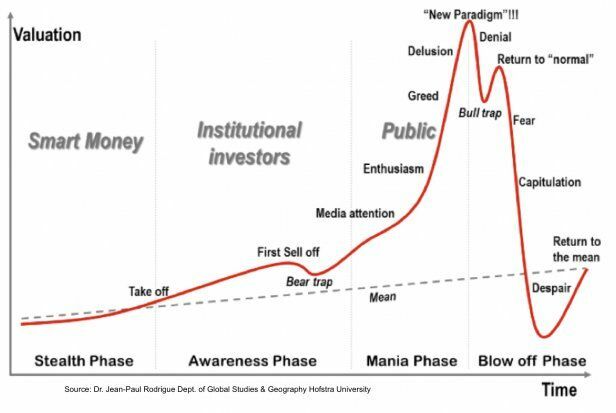 I'll start by saying that the current bull cycle has become almost parabolic and over-stretched (technically). Clearly, a correction is due but the market has lacked a strong enough fundamental catalyst to sustain any depth. Still, the further it pushes upward, the weaker the catalyst can be to cause a frenzy of profit taking and then a fear based sell-off. I think we could see a mild correction mid summer, 2018, which would mark the first "lower low" with a recovery not to exceed the current average. Then a real correction to 50% of the almost parabolic rise from 2000, to around 2300 or as far as returning to the previous 2000 area, which held steady for approximately 18 months from late 2014 through mid 2016. More seriously, I am TA only when it comes to indices: the professionals do FA much better than I could and then I follow their money. When the major stock indices are all looking really strong I'll also take some of the member stocks in indices I can't trade directly, like the FTSE AIM100 and FTSE250. TA is not much cop with out FA agree 100%. Where or why would a 50% correction come about I have no idea? Billions and trillions of money floating around where you gonna stash all that lolly away. One example, if you take it out of stock market and stick it into tangibles it still going to raise earnings for companies producing the stuff. There is no correction to make. Global economies pumped up with cash and that cash needs to move around and move around it will. What with the dollar losing value too will lead to more purchases of US goods. Agreed 100%. But then that presents me with a problem. How can you be so wrong about Brexit ! The problem with your theory is that a large proportion of the "US" goods are manufactured in China. 2019? maybe same as 2018 but even more volatility? Well it's not so much as a theory as an important consideration. If people sell up they're going to get cash out of stocks so what are they going to do with all that cash? I thought we'd have inflation long time ago but still don't see it. The inflation we do see is self inflicted as a consequence of currency fluctuations. Look at Japan has been in deflationary state for decades. So wrt inflation the jury is out I'm not sure about it anymore. US may have inflation as dollar depreciates but that's as above. I do think they will need to raise rates to attact buyers for their useless G debt. I see positive outcome for gold as dollar loses value and oil is rising at the moment not because it's scarce but simply because dollar is losing value and global growth is strong and continues to do well. So coming back to the original bloggers TA analysis about a 50% correction I can only ponder how? Oscar indicated the global economy is doing well because of Trump and Brexit and I almost fell off my chair laffing my head off. I dunno perhaps if Trump gets jettisonned and Brexit is over turned the global economy may crash 50% who knows? He could be right! You keep mentioning "all that cash" but you are ignoring all the associated debt. You are only considering one side of the balance sheet. It seems as though our understanding of inflation is very different, in fact I know it is. The evidence of inflation is everywhere but I suppose you won't see it until it becomes extremely obvious.i.e. Until the Central Bankers tell you. TA is giving me amber warnings. A 50% or more correction within the next 2 years is not beyond the realms of possibility. This means the markets can still soar to new highs making the subsequent crash that much more spectacular. Don't mean to upset but does G debt really matter that much? Can it be paid back? Should it be paid back? I know what you mean here but I did acknowledge that inflation you are referring to a large % has been as a consequence of currency fluctuation. I don't think we disagree on inflation but perhaps underlying cause is what we should be discussing. Is it a case of Excess Demand > Supply or simply currency fluctuation? TA warning is just a statistic like in the last 80 years temperatures in Australia never went above 47C and thus based on TA temperatures should drop back down to some average variant. Well maybe and maybe not. If global warming the FA, continues why shouldn't temperatures reach 49C even? If we get a 10 or 20% pull back even 30% be yeah ok so what, move on nothing to see here sort of thing. Talk of 50% fall is really stretching the imagination. Reminds me of the 15% drop in housing which bounced back with early green shoots as early as 2009 when some people were getting upset on these threads about challenges to their 50% melt down in property prices. Now look where we are. Look at fundamentals? Forget TA for signs. Candlesticks maybe for reading psychology of the market but on the whole TA is not much cop imo. 50% correction? Where's this come from? Anyway, for all I know (care), 2018 could see a 50% correction. I will be in cash by then, hopefully short by then. Be aware that 16 of the 20 worst single day falls in the Dow since 1900 came in downtrends, not suddenly out of the blue in a clear no-brainer bull market.